Raghunanda (Boman Irani) is a billionaire and a big Business Magnate based in Milan of Italy. He however is unhappy and wishes to reconcile with his estranged daughter Sunanda (Nadhiya) whom he sent out of his home because she married a Pleader Rajasekhar (Rao Ramesh) against his wishes. His grandson Gautham Nanda (Pawan Kalyan) promises Raghunanda that he would bring his atta (aunt) to their home on his 80th Birthday. Sunanda has 3 Daughters and two of them are Prameela (Pranitha) and Sashi (Samantha Ruth Prabhu). Gautham enters the house as Siddhu, a driver who was appointed after saving Rajasekhar from a Heart stroke. Gautham woos Prameela but his game ends after he comes to know that Prameela is already in love. Sashi turns rival to Gautham and is suspicious of him and Paddu (Ali) his friend and male nurse appointed to take care of Rajasekhar.To save Prameela's love, Gautham and Paddu go to the village and accidentally Sashi falls into the jeep due to a head injury giving her a memory loss. Gautham introduces himself as her lover for the time being and Sashi believes it to be true and falls deeply for him. That night the trio go to the venue and Gautham along with Paddu enter the house. They along with the bridegroom escape from there. After a fight they reach to Sunanda Nilayam and in the Journey Sashi regains her memory. Sunanda who knows Gautham's real identity much before the incidents warns him to leave the place. Moreover Siddappa (Kota Srinivasa Rao) the father of the bride asks for compensation to the hefty damage and Sunanda promises to give Sashi's hand for Siddappa elder son to which Siddappa agrees happily. To avoid future problems, Rajasekhar asks Gautam to leave the house and he vacates painfully. He later comes to know that Sashi loved him since Day 1 but was hesitant to express her feelings. He later on traps Bhaskar (Brahmanandam) and re enters the house as his assistant. Bhaskar is an rich NRI staying in Uganda who has fetish for girls. He lusts for Sashi but however his attempts are repeatedly thwarted by Gautham who wants to marry Shashi which is the access key to make Sunanda realize her wrong deed and reconcile. On the day of marriage Shashi elopes with Gautham and is waiting along with him for the train to Chennai. However Siddappa men reach to the station to stop them only to be trashed by Gautham and his assistants. By the words of his assistants, Shashi comes to know about the real motive of Gautham. Rajasekhar and Sunanda come in fury to shoot Gautham but however Rajasekhar is taken aback after knowing his true identity.Gautham then explains what happened the day Sunanda left the house. Raghunanda tries to commit suicide but his son (Mukesh Rishi) stops him and accidentally the bullet hits Gautham's mother (Pragathi) fatally. He explains further that he stood with his Grandfather though he killed his mother but Sunanda left her father as he injured Rajasekhar and sent them out from his house. Sunanda and Rajasekhar realise their folly and reconcile with Gautham. Sashi is dejected by this and is kidnapped by four henchmen appointed by Bhaskar. She narrates the entire story to the henchmen. Gautham and Paddu reach the spot and Sashi reconciles with Gautham. Bhaskar's wealth are undertaken by The Government of Uganda and he is left with the same amount with which he ran away from Rajasekhar's house when he assisted him in the past. Raghunanda reconciles with Sunanda and his house is full of relatives and Gautham is unanimously appointed as the CEO of the company thanks to the support of Sunanda and Raghunandan. The film ends with a scene showing Raghunandan hand held with affection by Gautham. 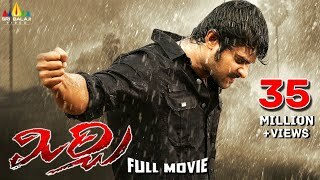 Varudu Full Length Telugu Movie || DVD Rip..